Duricef (Cefadroxil) is a cephalosporin antibiotic. It treats many kinds of infections including those of the skin, respiratory tract, sinuses, ears and urinary tract. 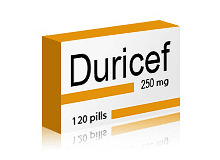 Do not take Duricef if you have any of these conditions: bleeding problems, kidney disease, stomach or intestinal problems (especially colitis), other chronic illness, an unusual or allergic reaction to cefadroxil, other cephalosporin antibiotics, penicillin, penicillamine, other foods, dyes or preservatives, pregnant or trying to get pregnant, breast-feeding.